Oscar Wilde’s most celebrated text, The Importance of Being Earnest has been dramatised on countless occasions, including the much loved 2002 film starring the rather delicious Colin Firth! Set in a rather quaint Victorian Hertfordshire Manor House in the English Countryside, The Importance of Being Earnest focuses on the farcical turn events between two friends Jack Worthing and Algernon Moncrieff. Both Jack and “Algy” at some point enjoy masquerading around pretending to be a fictitious chap named Ernest. With the pair of gentlemen living strange but double lives as the mysterious Ernest, they manage to bring about all kinds of trickery and tom foolery in both London and Wootlton, charming ladies and spreading gossip! The play was intended to be a satire of Victorian society, with many traditions and social norms being mocked throughout the narrative. Presented by the Bunbury Company of Players, this revival production of a Wilde classic is directed by Lucy Bailey (RSC, Old Vic) and stars Nigel Havers (Downton Abbey), Sian Phillips (Cabaret) and Rosalind Ayres (Outnumbered.) The cast also includes Cherie Lunghi, Martin Jarvis and Christine Kavanagh. 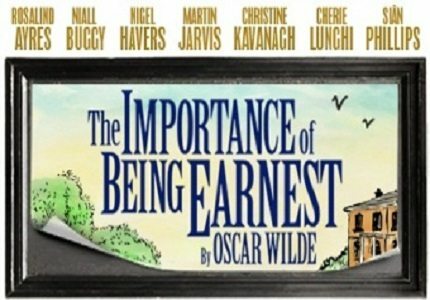 The Importance of Being Earnest will run at the Harold Pinter Theatre from the end of June (press night 17th July) until the 20th September 2014. Whist the show is not aimed at children, keen youngsters over the age of 8 may enjoy the show for its cultural and historical importance. Literary references aside, older children may also enjoy the humour of the show.